Today hundreds of fishing boats sit marooned on cracked, dry mud as vultures fly above the shores of the once productive fishing zone 30 kilometres (19 miles) east of the southern African country’s old capital Zomba. 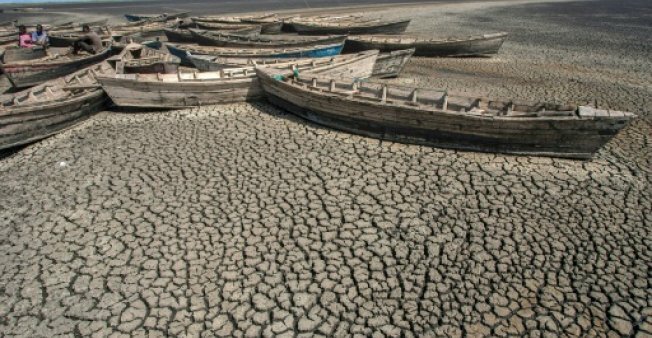 Julius Nkhata, a local villager, says the increasingly dramatic seasonal dry-out of the lake — blamed by experts on man-made climate change — has displaced local people and increased joblessness. Fishing used to earn her as much as 15,000 kwacha ($20) a day — enough to feed and clothe her five children, and send them to school. The lake once provided about 30 percent of the country’s fish, worsening its food hunger problems.